We are a leading service provider for the Cutting Software. OmniWin 2013 is effective and economical for small production runs in the machine and manufacturing industry, as well as in just-in-time manufacturing with changing quantities at custom cutting operations. OmniWin 2013 is the ideal tool for production planning with thermal cutting for oxyfuel, plasma and laser cutting with CNC machines. OmniWin 2013 combines the highest technical flexibility with fast, efficient processing. At the same time you will reduce your costs by minimizing material usage. The integrated operation with CAD, import and nesting for vertical and beveled parts permits a dramatic simplification of your working processes. OmniWin 2013 Classic is the powerful tool for the optimum designing and nesting of thermal cutting parts. Everything functions quickly and intuitively. Ideal for daily use with oxyfuel, plasma or laser cutting operations including complex machines with higher throughput in multi torch mode. You profit from the total potential of your thermal cutting machines and can configure them for the widest variety of processes, materials and applications. Suitable for simple to complex scenarios as Standard/ Enhanced/ Professional Editions. Today decisive demands on software are made in production planning for thermal cutting environments. It must be capable of designing parts efficiently, compactly nesting them in to optimize use of material as well as generating the NC code with which the cuts can be made quickly and of the highest quality. Diverse strategies are necessary to cut the widest variety of different shapes, materials and thicknesses. Cutting edge developments such as Messer Hole Technology have been created to advance plasma cutting technology to new heights. In addition, the software must also be the brain of the production, in which the orders are efficiently referenced, plate utilization managed, part designs and nested plates easily found and reused. A central data management with multiple user support is essential for larger workshops. OmniWin 2013 Classic is the tool for demanding tasks in production planning which has proven itself for decades. It is also suitable for highly complex machines in factories of every size where the cutting processes plasma, oxyfuel, laser and waterjet are used. OmniBevel 2013 is the professional software product for bevel cutting. It represents straight cuts, cylindrical holes, exact bevel angles and parts with absolute dimensional accuracy. The application is also characterized by enormous flexibility. Almost all possible technology parameters and operation details can be adjusted. To achieve quality bevel cuts the NC code generated must be matched exactly to the capabilities and performance of the machine used. Lateral and angular offsets must be allowed for on all cuts. Lead-ins and lead-outs as well as joining macros between individual contour areas must be placed in such a way that no damage to the contours occurs. Bevel cuts make the highest demands on the programming of the cutting plan. OmniBevel 2013 is a postprocessor module with graphical user interface. It inserts bevel information and technological requirements into NC plans in such a manner that the machine used gives optimum cutting results in automatic operation. With OmniBevel 2013 you are using the tool which will guarantee you the best quality when bevel cutting. OmniBevel 2013 brings out everything possible from your machine with a bevel unit. OmniSigma 2013 is the most comprehensive tool offering the ultimate in advanced nesting and advanced motion-optimized NC programming to minimize scrap and increase machine productivity. It sets new standards for cost-optimized process technologies, multi-vendor environments plus extensive interfaces for integration with ERP/MRP. For common-line cutting, bridge cutting and chain cutting. OmniSigma 2013 gives you the ability to track jobs and remnants to help streamline production. OmniSigma 2013 is ideal for all profile cutting machines, including laser, plasma, oxyfuel, waterjet, router and combination machines. OmniSigma 2013 is the high-end solution in the successful product range of MesserSoft and one of the most powerful cutting solutions worldwide. 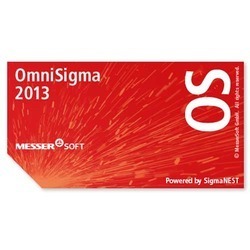 OmniSigma 2013 is powered by SigmaNEST from SigmaTEK. With its ultimate functionalities it saves engineering time through simplified programming and more efficient machine output. You reduce or eliminate scrap dramatically, handle more orders in less time and extend life of your machine consumables. You just need one software to program all major profile cutting and punching machines. You gain maximum flexibility in file conversion and importation. Challenging nesting and cutting tasks are done automatically by OmniSigma 2013. For future use you save custom shapes into the standard part library. Nesting provides maximum yield per sheet. Higher levels of continuous cutting with minimal pierces are easy to reach. For maximum consumption of remnants OmniSigma 2013 effectively manages your raw material inventory. Through the OmniSigma 2013’s open architecture your systems are completely customizable. Moreover it provides users with the maximum amount of flexibility in post processor configurations. Messer Plamill - the flagship plate processing center.Plamill is a unique combination of Plasma cutting, Milling, Drilling, Tapping & marking system. With rapidly increasing demand for components with multiple operations on medium thickness plates with speed, accuracy & reliability, Messer has come up with a unique state of art solution for its customers - "Messer Plamill with straight and bevel cutting”. With a positioning speed of 36 meters per minute, multiple operations upto 50 mm thick plate becomes accurate & quick. High precision machine construction with dual beam provides a sturdy & long-lasting performance over the years. The prowess of this machine is the automatic tool change process, which can change upto 8 tools. This takes Plamill into higher levels of productivity by avoiding human intervention. By using helical milling & slot milling operations, bigger holes & slots can be made. The coolant is optimally spread for this operation to enhance tool performance. The unique marking system helps the user to mark the components with order numbers, part numbers, client name & component name for easy and unique identification. Messer CNC is a well known name in plasma cutting and edge preparation. When you want to detach the part from the plate, and make post cut edge preparation like V ,Y , X & I cuts, the front beam of this machine comes into action. It has a sophisticated and Robust plasma torch station which can be coupled with varieties of plasma sources depending on thickness and type of material to be cut. When you have components which involves plasma cutting, plasma beveling, counter sunk boring, drilling, Tapping, Marking, Thread milling, Slot milling, trust “Messer Plamill”. Looking for Cutting Software ?